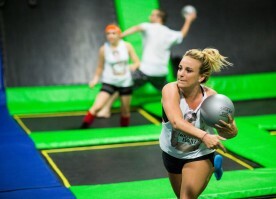 House of Air, in association with the American Trampoline Dodgeball Association of America, offers trampoline dodgeball leagues! Each league only has 8 team spots available. Want to play? Call House of Air and register your team today! 7 week season with each team playing 3 games per night every week. The 8th week will be double elimination championship tournament! Be sure to wear athletic clothing – you will get hot and sweaty! Team uniforms and costumes are welcomed and encouraged! $800 per team. In addition to full park access on game nights, a championship night and all the fun you can handle, Dodgeballers also get a pair of ridiculously cool knee high grip socks! Every Tuesday from 4-6pm. Participants will have exclusive access to the colosseum from 4-5pm. 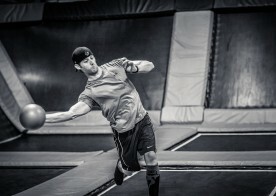 During that time, participants will practice dodgeball drills, as well as play games with other clinic participants. House of Air staff will lead the drills and games. 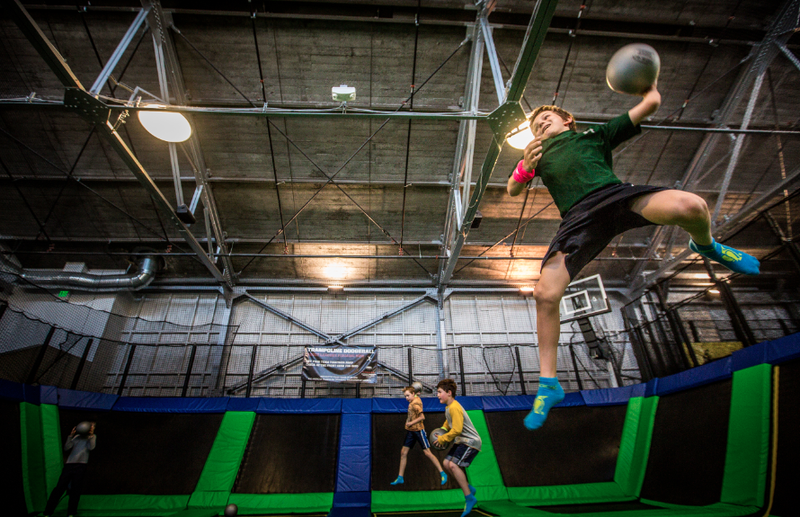 During the 5-6pm hour, participants will have access to not only the colosseum to practice their dodgeball skills, as well as the matrix for open jump. Club members will receive one pair of awesome flight socks! Call us to join the club! Each match is 8 minutes long, teams play as many games as possible. A team wins a game when they get all the opposing players out. Each team starts with 3 balls. Each team starts with 8 players on each team; minimum of 3 female players on per team. The team who won the most games at the end of 8 minutes won the match. If the case of a tie, a tie breaker game is held. You are hit with a ball ANYWHERE ON YOUR BODY. You throw a ball and someone catches it. You cross the green boundary, including reaching over for a ball. You argue with the referee. You attempt to block a ball with another ball and drop the ball being used for blocking. Walk across the center green pads with your hands wrapped around your head. Only 1 person is out per throw. 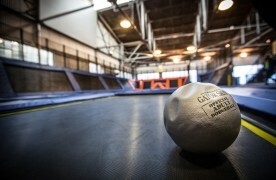 A ball is defined as dead once it touches ANYTHING: person, trampoline, mat, etc! Only the player who the ball is being thrown at may catch it to get the thrower out. You may catch a ball with any part of your body. Referees have the final say. Call House of Air to register your team!